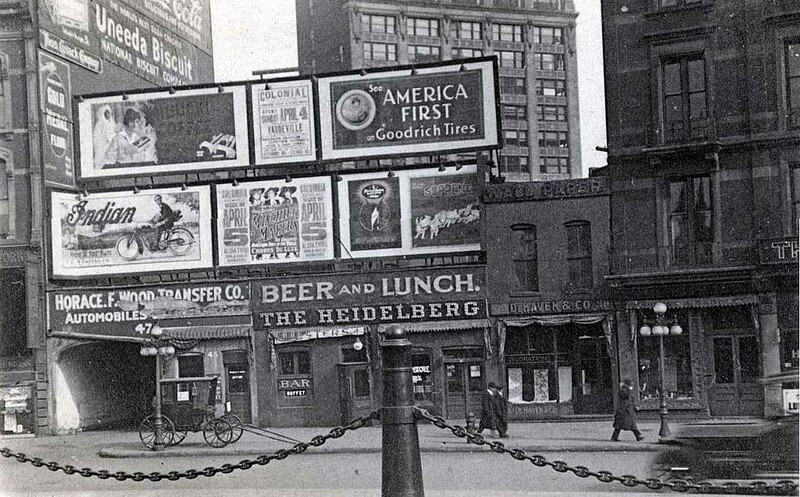 Visitors entering the grounds of the Arsenal, be it the United States Arsenal in the 19th century or Arsenal Technical High School since 1912, first had to check into the guardhouse on Michigan Street. This small but decorative brick Italianate structure has housed guards and security since first completed in January 1872. 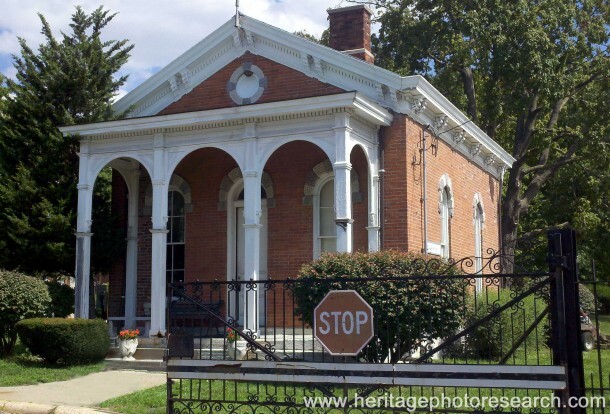 Soon after the Civil War, when the US Arsenal was constructed one-and-a-half miles east of downtown Indianapolis, the federal government ordered two guardhouses built on the grounds. 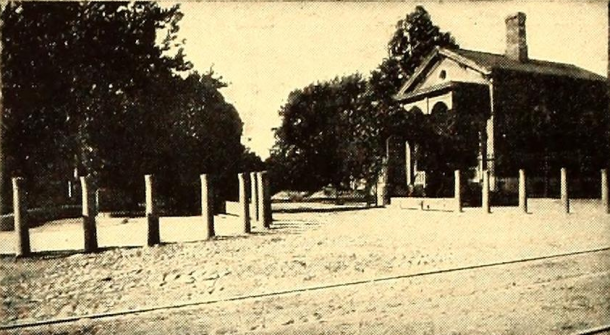 The circa 1916 photograph above shows the first guardhouse, built in 1867, that stood in the center of the campus quadrangle closer to the Tenth Street entrance. 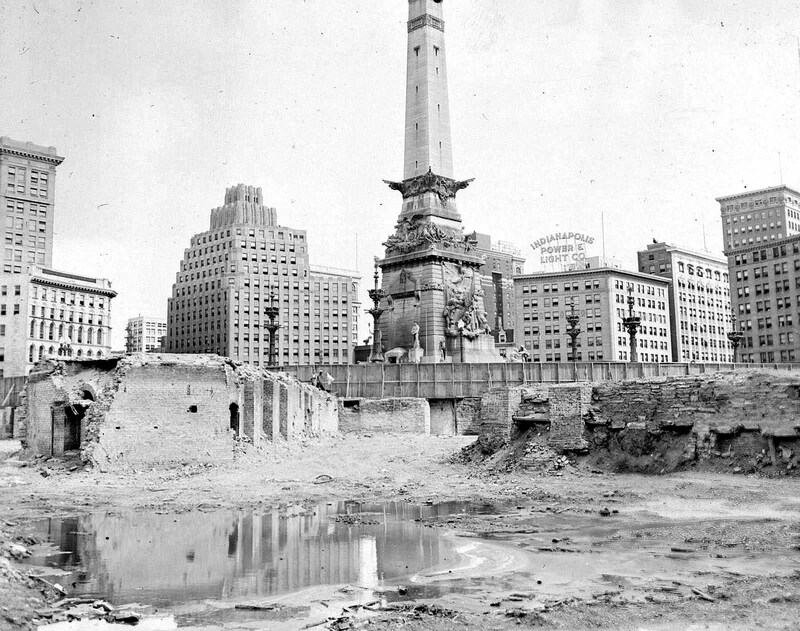 It was destroyed by fire in August 1921. 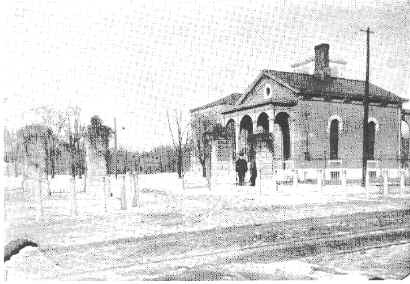 Although very similar, this structure was slightly longer and had five windows along the long side, as opposed to two on the Michigan Street guardhouse. Along with serving as the sentry post of the Arsenal, unruly soldiers derelict of their duties or breaking the rules forbidding “intoxicating drink and passionate language” could find themselves locked up in holding cells in the basement. “The prisoners were watched rather closely. While in the Guard House they were not allowed to keep in their possession anything except the necessary changes of clothing. They were required to make their beds neatly in the short time between reveille and the morning call to work. All their meals were eaten in their cells.” The worst offenders were left in a dark basement cell for a week with only a bread and water diet. 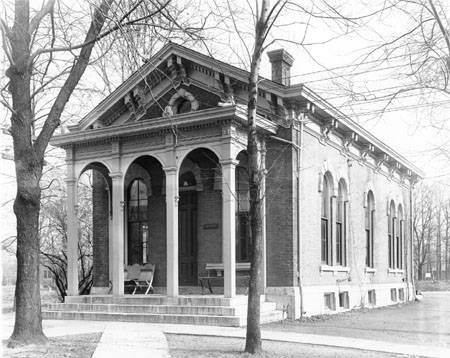 In 1904 the government no longer needed the Arsenal and sold the land to the Winona Technical Institute, a short-lived manual training school that went belly up by 1910. In September 1912, Arsenal Technical High School opened on the grounds. Students and staff used the old guardhouse as a lunchroom or beanery, but soon outgrew the space. 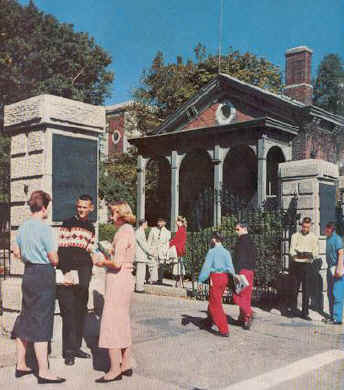 For most of the school’s existence, campus security has used the building, now known as the gatehouse, to register visitors and keep an eye on the comings-and-goings of students (as seen in this 1959 photograph). 1979 slide courtesy of Indiana Landmarks. Seen in front is architect H. Roll McLaughlin, long-time board member of Indiana Landmarks. Three years earlier he helped prepare the National Register of Historic Places nomination for the site. 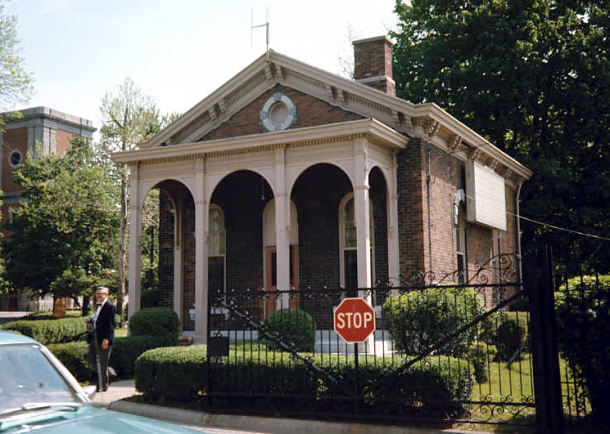 Although the guardhouse has remained remarkably unchanged through the years, it was in need of work and the graduates of 1952 took up the cause for their 50th reunion project. The class spearheaded efforts to raise over $150,000 to restore the structure, including tuck-pointing and mechanical and technology updates. Kudos to school administrators for valuing the rich history of this site and preserving the guardhouse and other buildings on the campus. Congratulations to Arsenal Technical High School students, staff, and alumni as they celebrate their 100th anniversary! Thank you for presenting this history of the Michigan Street Guardhouse in this Centennial Year of the school. Joan, as someone who lives across the street from Tech, I love hearing stories about the Arsenal and it’s use as a school. It gladdens my heart when we can hear about parts of the property being preserved and restored. I am concerned, however, about the condition of the iron fence around the property. In the 15 years that I have been across from the school, it has continued to deteriorate and lose bits and pieces (in fact, a gate along Oriental Street within the last two weeks is now missing!). This fence has to be one of the largest 19th century fences remaining in the city, especially since the old Central State Hospital fence now seems to be missing, and the Women’s prison fence on Michigan is almost gone, too. Has Tech thought about doing any preservation/restoration work? It would be a shame to lose this important part of the historic Army Arsenal fabric at Tech. Only about a block south of the guard house is the Sturm Esplanade, with beautiful, but deteriorating old homes located on the street; its designed with a median similarly found in Emerson Heights. Since COL Sturm was the first Commander of the Arsenal and apparently located it on grounds that occupied a portion of his farm property (don’t have any research to back that up; that’s why I said “apparently”), his widow did continue ro own the land immediately south of the Arsenal into the late 1900s, even after the surrounding area had long developed into what was then a middle income area. Any research tracing the development of this adjacent neighborhood would be appreciated, if possible. Downtown Tim: Since I live in the adjacent Cottage Home neighborhood, I, too, appreciate Tech’s history and the efforts to preserve the campus. 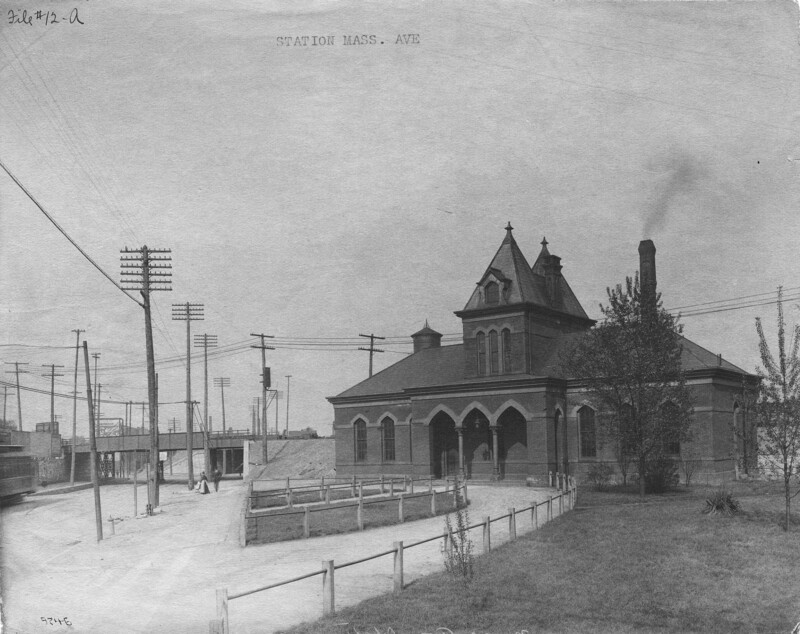 The iron fence, constructed in 1894, replaced the original wood fence and should be preserved. I’ll ask if there are plans to preserve the fence and report back. Basil, I have research files on Holy Cross, Willard Park, and Arsenal Heights, the three neighborhoods south of Arsenal Tech High School. 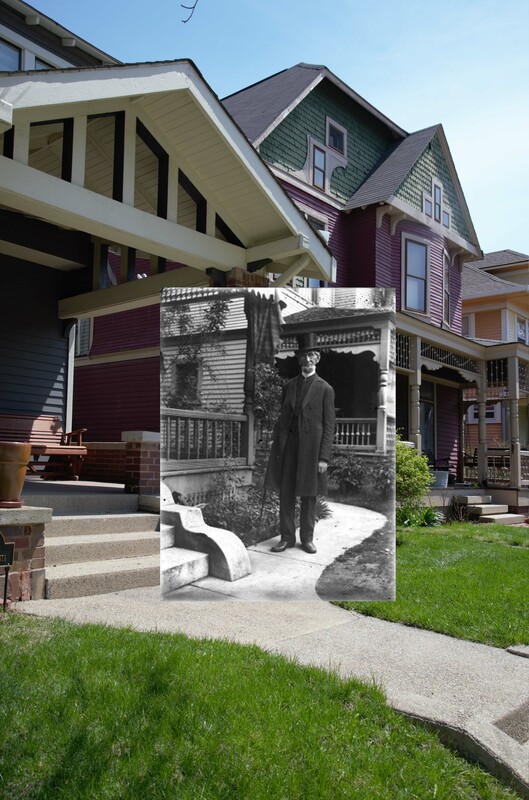 I’d love to write a Then & Now article on General Herman Sturm’s house (now the site on condos), but the Indiana State Library’s photograph of the house is missing. If anyone has a source for another photo, please let me know (heritagephotoservices@gmail.com). In the summer of 1948 (? ), a girls’ day camp was held on the woodsy campus of Tech High School. Even though we lived near Irvington just off Emerson Avenue, a small group of us attended the two week camp. Our favorite camper was Dorothy Morris, the first young African-American girl most of us had met. We invited her to visit us on N. Bancroft St and learned that, like my step-father, her dad was an attorney. The $10 fee was nominal in the hope that children who had little contact with nature and camping activities might be able to attend. We had the usual outdoor activities, including crafts and games. It gave us something fun to do when the vacation Bible school sessions ended. I recall when the Michigan streetcar was attached to an overhead electrical line. I’ve wondered when that ended.